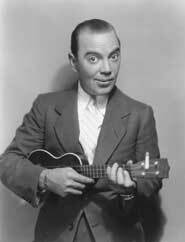 If you were to ask me who my favourite ukulele player is , I would have to say Cliff Edwards, AKA ‘Ukulele Ike’. During the 1920’s Cliff was one of the biggest stars in the US, he sold millions of records and appeared in many films. He was the first to sing many famous songs, indeed his biggest hit was ‘Singing in the Rain’ which he recorded in 1929 long before the film of the same name. He sang the Disney theme song ‘When You Wish Upon A Star’ and was the voice of Jiminy Cricket in the film adaptation of Pinocchio. Sadly he died a penniless alcoholic in 1971 forgotten by all but a small band of ukulele aficionados. 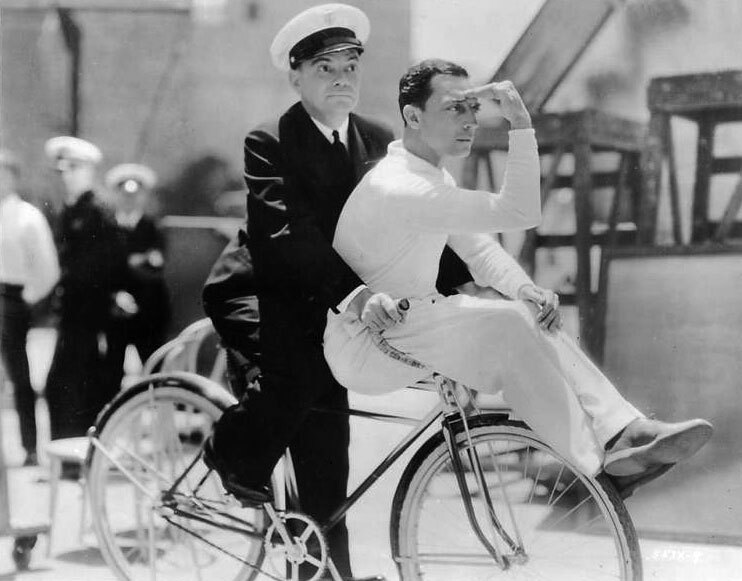 Today I got rather excited when I found a picture of him riding a bicycle on the MGM lot and carrying Buster Keaton on the handlebars. And so from my 78rpm collection here is Cliff at the height of his career with the song ‘You’re My Weakness Now’ recorded on the 7th December 1928. PS. I have updated my ‘About’ page and added a ‘Gramophones’ page to explain how I make my 78rpm transfers. Click on the tabs at the top to take a look. “Sony Music Entertainment” seem to have decided that your music belongs to them. I could still play it (and yes, it’s excellent), but only on the youtube site itself. There are so many reasons why I already disliked that company. Here’s another. How long does copyright last these days ? 1928 is an awful long time ago. Your record was pressed nearly 20 years before Sony was established. @David… The copyright laws on music are very strange, I suspect Sony have bought up a number of Cliff Edwards songs hoping to cash in on the ‘ukulele boom’. I had a note from youtube when I uploaded saying, I did not have to do anything but the song would not be available in Germany. The software they use to track things must be amazing because it caught the song even though it comes from my 78 with all it’s clicks and pops. Strangely they don’t seem interested in the other Cliff Edwards song I posted yesterday. It is sad to think that Sony are still making money from Cliff Edwards, but that when he died he was so poor he was buried in an unmarked grave. His headstone was only added after US ukulele players shamed Disney into purchasing one.